Kneeling in the fragrant moist grass of the village green Clara Morrow carefully hid the Easter egg and thought about raising the dead, which she planned to do right after supper. 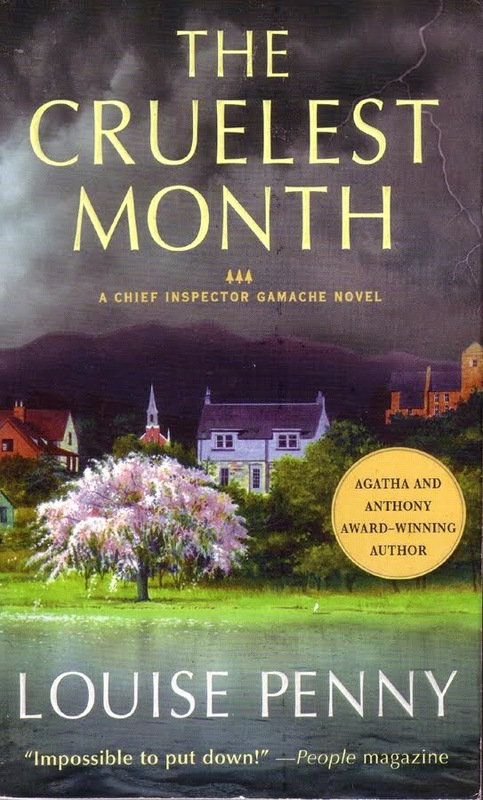 The Cruelest Month by Louise Penny wastes no time getting right down to it's eerie business. A beautiful, terrifying murder mystery with a supernatural twist, this book rivals the best of the best and could very well be one of the best mystery crime novels I have ever read. The town of Three Pines has had it's fair share of misfortune. So when a seance is suggested to mix things up and add a bit of harmless fun to the Easter season, some think it's a wonderful distraction and others think some things should be left alone, some things are better off dead. But the villagers hold their seance in the spooky old Hadley house overlooking the village anyway. And something, or someone is awakened and answers their call. One of their party dies of fright, and the brilliant Chief Inspector Gamache must come to decide whether it was a real monster, or the monster inside one of their own that committed the crime. Filled with secrets, intrigue, scandal, ghosts of the past, and perhaps ghosts of a different nature, Three Pines may not be ready for what Inspector Gamache will find. There are many different kinds of murder mystery novels. There are those with complicated mysteries that are difficult to follow, and inversely there are those that are so easy to follow that the mystery isn't a mystery for long. There are those that are beautifully written, and there are those that could use a bit of work. And then, in those rare cases, there are those that are complex, and beautiful, with dynamic characters that keep you guessing until the last inevitable outcome. This is one of those books. What struck me the most about this book is Penny's prose. The writing style is so elegant, beautiful, descriptive, and poetic that it actually creates the atmosphere. The choice of words in itself weaves of web of deception and mystery and eeriness that matches the spooky setting. It's a book that begs to be read aloud. Which I did, to my boyfriend, several times. It's a good thing he likes me. But, of course, what would a mystery novel be without it's genius lead detective? Chief Inspector Gamache may be my favorite detective ever. Hercule Poirot (Agatha Christie) and Cormoran Strike (Robert Galbraith) have their skills of interview and intuition, but Gamache has something more. His persona is so warm and inviting, that it almost contradicts the genius detective part of his personality. But somehow the two parts create a wonderful whole in this caring, loving, honorable man who deeply understands people, and all too often must understand deep enough to uncover monsters among men. As this is the third book in the Three Pines/Gamache novel series, I recommend you start with the first, Still Life, to truly appreciate the character development. But, this book stands strong alone and can be the only book you read of the series. Though, I doubt once you read it you'll be able to resist returning to Three Pines and following Gamache anywhere he leads you. "It was true, Gamache knew. Of all the things we keep inside the worst are the secrets. The things we are so ashamed of, so afraid of, we need to hide them even from ourselves. Secrets lead to delusion and delusion leads to lies, and lies create a wall. Our secres make us sick because the separate us from other people. keep us alone. Turn us into fearful, angry, bitter people. Turn us against others, and finally against ourselves. A murder almost always began with a secret. murder was a secret spread over time." Happy Halloween! Use the link below and your purchase will help support the Lone Book Club!